The contents of this page are the personal opinions of David Flater. They do not represent endorsements or criticisms by anyone and have nothing to do with reality, such as it is. You pays your money and you takes your chances. Reading this page may cause your aunties to spontaneously combust and Sumerian deities to fly out of your nasal passages at inconvenient times. Run away! All trademarks are trademarks of their respective trademarkers, in the U.S. and other countries, but possibly not. Prosecutors will be violated. Viscosity: The sauce must be thick enough that you can't see through it, but not so chunky that it could be mistaken for salsa. Purity: There must actually be chile peppers in it. Making hot sauce out of tomato purée and pepper extract is like making wine out of grape juice and grain alcohol, or making soy sauce out of hydrolyzed soy protein and caramel color. You're supposed to ferment it, dummy. Anti-Salinity: Tabasco has a sodium content of only 30 mg/tsp, and nobody ever complained that it was bland. Anti-Novelty: The label should not be too funny. There are thousands of novelty labels out there and no particular reason to believe that the bottle contents are worth tasting. "The chinense varieties have an unmistakable, fruity aroma and taste that some people describe as apricotlike." — Dave DeWitt and Paul W. Bosland, The Pepper Garden, Ten Speed Press, Berkeley, CA, 1993. Habanero or scotch bonnet based hot sauces in which you can taste this twang, possibly augmented with other fruity flavors, are categorized as fruity. 2011: No longer available in my town. Cumin: a smoky or barbecue-esque flavor. 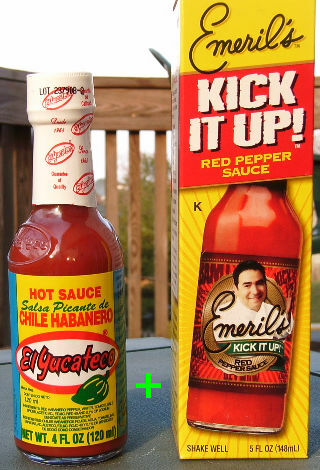 Spicy: kicked up some other way, with a flavor that is neither smoky, nor garlicky, nor fruity, but definitely not plain. What goes on chicken or vegetarian chikenish-flavory-chunkies. Oh, wait, stop the presses, there's an extra hot version. The great is the enemy of the good, not to mention the bad and the ugly. One way or the other, these sauces didn't make the cut.